B) says he has a problem. This story has encouraged me to address other things about my life. 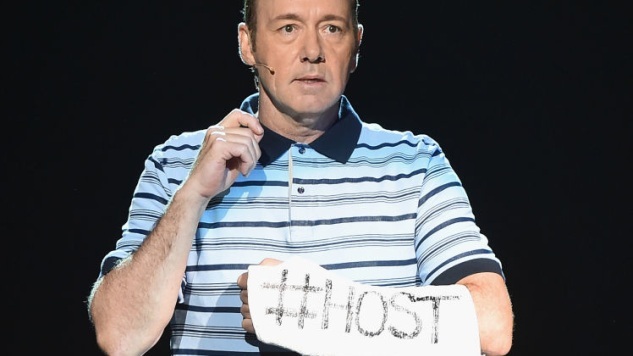 If Spacey committed the acts that Rapp alleges, then he will join the company of Weinstein and similar men. And the Weinsteins of our world have a notable tell when they are caught: they plead for self-care. I have since learned it's not an excuse, in the office – or out of it. To anyone. I realized some time ago that I needed to be a better person and my interactions with the people I work with have changed. I appreciate the way I've behaved with colleagues in the past has caused a lot of pain, and I sincerely apologize for it. Though I'm trying to do better, I know I have a long way to go. That is my commitment. My journey now will be to learn about myself and conquer my demons. ... I've brought on therapists and I plan to take a leave of absence from my company and to deal with this issue head on. Crime is not a chance to engage in an elaborate regimen of self-care. Let’s repeat that several dozen times until everybody gets the message. Crime is crime. It doesn’t mean a spa day. It doesn’t mean a chance to pause, and reflect. That’s not how this works. Crime is not an opportunity for self-care. We cannot consider the problems of the world as the single actions of individuals. We have to consider systems. Powerful men are not powerful because they are individually strong, but because they are the keystones in a larger system. Whenever a powerful man claims self-care as his escape clause, what does that mean? It means he wants us to forget that he has money and might at his back—focus on me, the solitary individual. But where was that regard for individual suffering when they preyed on weaker folk? The Weinstein problem does not end when the Weinsteins go to jail. It ends when the systems that such men build are demolished. There will always be pathological men. We must remove their tools—the institutions of power and privilege that abet their crimes. Weinstein and all of the other men in the big predator list are taking advantage of the loophole in our social consciousness. Despite what you read in the media, or what you see on television, American society is much more compassionate than it was twenty years ago—even five years ago. We’ve taken giant strides in how we deal, publicly and privately, with mental health and issues of addiction. Americans from all walks of life understand how stress, and the wear and tear of modern life, can work changes on all of us. We speak the language of stress and self-attention. It is excellent that we do so. We must make these taboo topics tolerable in civilized discourse. What is not acceptable is for the powerful to grasp the reins of sympathy so blatantly, and so shamelessly. Self-care cannot include everybody’s self-care. Self-care cannot be allowed for people who have only ever cared about themselves. No human being thinks they’re a monster. Himmler didn’t fancy himself brutal, and the lines of hell are lined with men who’d tell you they were doing the Lord’s Designated Work. So perhaps it’s only natural and expected that Weinstein-level criminals would describe their public shaming as an occasion for healing. Even if Weinstein is serious, this blindness is part of the larger moral and ethical myopia which allowed him to prey on his fellow human beings across decades. It’s the same impulse that allows Trump to complain online—and to children—about how slandered he is. Self-care is important, but our greater care must be the whole world—and all the other selves in it.